Bike Trailer Buying Guide – You can find it here. What’s so good about this Bike Trailer? There are numerous Bicycle Trailers out there, from cheap copies, to six hundred pound plus ‘top of the range’ examples. We researched the market looking for the best Bicycle Trailer in the popular one hundred to two hundred pound range and came up with this one. It’s an un-branded model direct from the original manufacturer. This is an exceptionally sturdy trailer with good quality fittings and cover. It is well designed and put together with loads of elbow room for two children – Please note that we have found some copies for sale, which do not comply with the current safety regulations. If you want to know more about this issue, then please see our section on Safety Standards for more details. Explore Outdoors with the Children – Why leave them behind when you can take them with you! Our Bicycle Trailer has generous accommodation for up to 2 children. It is surprisingly easy to tow, with little resistance, and is quick and easy to assemble for storage and transportation. It comes complete with a weather cover, should you get caught in the rain – Click here for more detailed pictures. Are you planning to visit somewhere by bike? You can easily go for a stroll at your destination – Just attach the free Bicycle Trailer Jogger Kit (which neatly stores in the Bicycle Trailer boot) and you have a buggy ready to use. Sleepy kids – no problem. 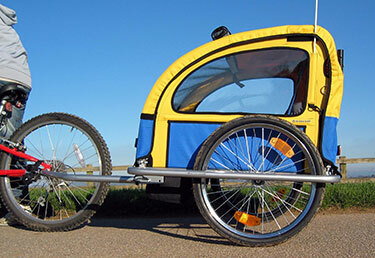 More info on our Bicycle Trailers can be found here – Bicycle Trailer – Detailed Descriptions. If you would like to go for a run or walk and take the kids with you, you can! 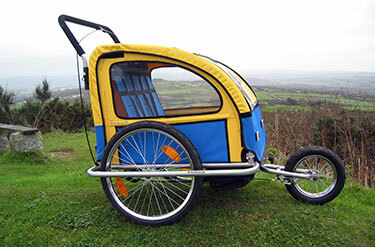 The Bicycle Trailer instantly converts to a Bicycle Jogger with our free kit. The size of the wheels mean that it is easily pushed along tracks, unlike push chairs with small swivel wheels. There is little friction, and is very easy to control. Plus it comes with a hand brake (as fitted on a bicycle) so you can keep pace on those down hill stretches – More detailed picture can be found here. We recommend that you purchase a safety line, so if you should accidentally slip or trip, you’re still attached to the Bicycle Jogger. More info on our Bicycle Joggers can be found here – Bicycle Jogger – Detailed Description. Our Bicycle Trailer has a strong, solid steel frame, and comes with two simultaneous methods of connecting to a bike for additional safety. Side protection bars are provided, as well as inbuilt 5 point safety harnesses, a fly screen and high visibility flag. The colour has been chosen for looks and high visibility. There are between 8 – 10 reflectors fitted (dependant on the configuration). The Bicycle trailer / Jogger has been tested by TUV and complies with all the current European Safety regulations. Our Bicycle Trailer has been tested to European standards and is manufactured under the ISO 9001/2000 quality standard. Each Bicycle Trailer is checked & assembled before dispatch. Note: Similar types, (sometimes copies) claim to be fully tested and certified but are not! (please see our section on Safety Standards for more details).